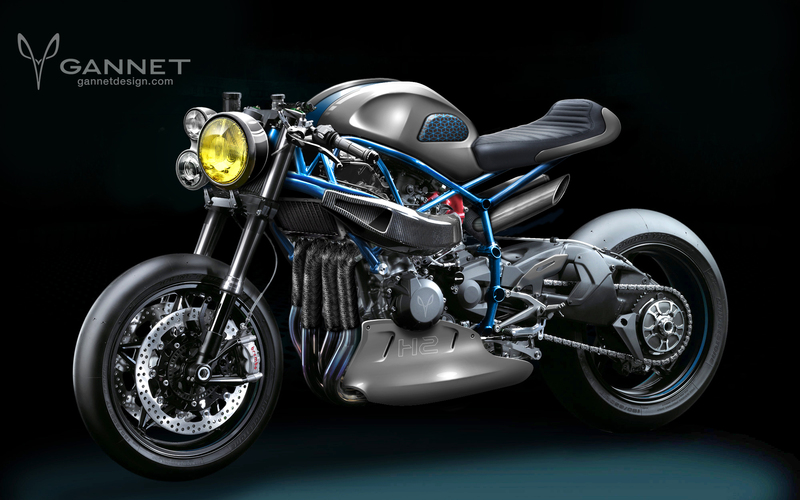 Custom Kawasaki H2 GANNET , a “naked” roadster version of the newly presented Kawasaki Ninja H2. By taking off the original fairing of the Kawasaki, we could expose more of the technical elements and beautiful trellis chassis. We created a rugged design with some retro detailing, but at the same time modern surfaces and volumes. A new tank design and subframe for the tail section which integrates into the exposed main trellis frame. The underbelly fairing design is a loose reference to the vintage Kawasaki H2 racer from 1972 and gives the bike a good stance and visual stability.